How much time do you spend hunting for a specific drawing? InfoSort can help you find the exact drawing you want in minutes –anywhere, anytime. Complete, Secure, and Accessible – InfoSort does it all. We create, manage, store, and update your drawing database. Best of all – we make it available to you on the web, so you can access the drawing you need – where and when you need it. InfoSort® is a powerful, yet easy-to-use web-based tool that finds the drawing or document you want when you want it in a completely secure environment. 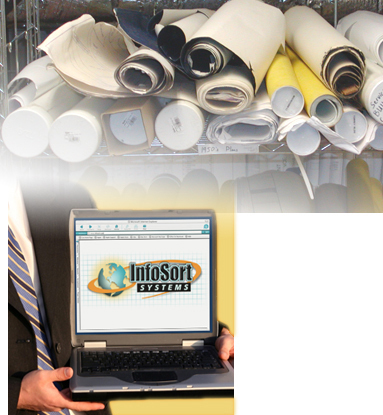 InfoSort Systems can help you archive both your CAD drawings and scanned images of your existing hardcopy drawings. Retrieval is a snap – You can easily search for a drawing by specifying the building, the floor, the trade (architectural, electrical, landscaping, plumbing, etc. ), or the project number. Once you find the drawing you are looking for, you can view the drawing and enter comments. The database and drawing files are stored on our server, so you never need load anything on your servers or your in-house computers. Since InfoSort is web-based, it is available anywhere – in your office or in the field – anytime – 24/7.